From left to right: Barack Obama Wearing Joker Makeup, Boxxy, Subcommandante Marcos, @JennyHolzerMom , Barack Obama Wearing Guy Fawkes Mask. Over the last year, America spent $1.6 billion to decide what kind of father figure it wants for the next four years. On November 6, the compassionate + drones father beat out disciplinarian + Mormon father in 8 out of 9 battleground states, and now the cycle begins again as we project on him our collective insecurities and ultimately blame, symbolically kill, and ceremonially consume his remains. 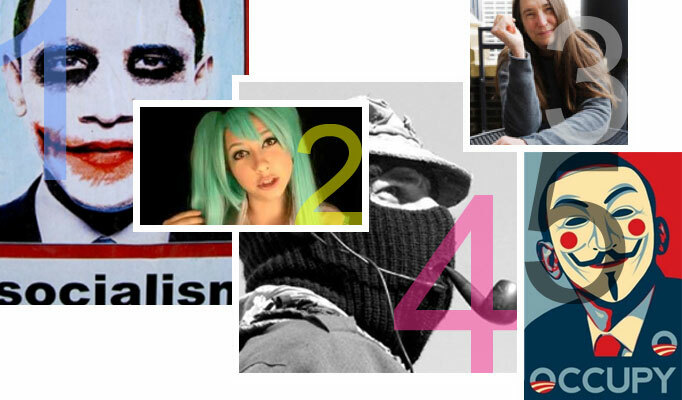 In this spirit, I thought I would offer up my favorite avatars, each with its own flavor of anti-establishment rancor. My interest, however, is not purely topical. Within weeks of arriving at the USC Roski School of Fine Arts, our Dean abruptly went on leave, leaving behind her the question of leadership. The students’ name for that question is Collective Dean, and at first he / she / it was just a question, but has quickly become the generative material for producing avatars – images, objects, and language to convey a reflection of being a subject. So my classmates and I have been thinking about the forms of subjectivity that can represent a collective, or a collective that represents an individual. Barack Obama Wearing Joker Makeup. A picture of Obama overlaid with Heath Ledger’s makeup from the “The Dark Knight” (2008) became a highly circulated Tea Party icon. The exact rhetoric of this image is a bit obscure – it seems to be more creepy than didactic. However, it picked up on the fascist strains within the recent cycle of Batman films, which dwell heavily on the State of Exception, with Batman as Agamben’s “force-of-law.” Some may argue this is not an avatar, but I would argue that its rhetoric is so cryptic that it functions more as an avatar for the Tea Party than as a critique of liberalism. Boxxybabee is a bubbly teenager with lots of eyeliner who puts videos of herself on Youtube, and became the cause of a flame war on 4chan between those who denounced her and those who would crown her the queen of /b/. As Alexander the Great was spontaneously crowned by the Macedonian army, so Boxxy was fiercely defended by her fans, and just as vigorously denounced by her haters. In a bizarrely appropriate metaphor for the American political process, the conflict was so intense that 4chan launched a DOS attack on itself just to stop the madness. Boxxy has claimed that she is purely an on-screen identity, then renounced this claim as that of an imposter named Svetlana, and has also claimed both Boxxy and Svetlana as personae. Not that it matters. As Barbara Tuchman suggests in the Guns of August, once a flame war has begun, it may have little relation to its cause. @JennyHolzerMom is the Twitter handle of someone using Holzer-esque language and capitalization to dramatize the daily negotiations between mothers and their offspring, for example “PARENTING IS A KIND OF INDOCTRINATION AND ONE DAY YOUR INDOCTRINATION WILL COMPEL YOU TO THANK ME.” The simple device relocates the violence and paranoia of Holzer’s cryptic political aphorisms to the heart of the Oedipal machine: the parricidal conflict of parents and children, reproducing its own conditions generation upon generation. As leader of the Zapatistas, the Subcommandante always appears masked, identifiable primarily by his pipe. While the “person” inhabiting the identity of Marcos may be a leftist intellectual of middle class origins, Marcos is the “dual translator” of rural indigenous histories and urban Marxist theory. A Marxist revolutionary movement seems like it needs such translating figures to become the everyday practice of resistance or even the historical reality of revolution. Marxism would just be an aspect of 19th century European thought had Mao Zedong not “gotten Marx wrong” and transformed it into a rural, third world ideology. The mask, taken from “V for Vendetta” (2005, based on the Allan Moore comic 1982-1985 written in response to Thatcherism), became associated with Anonymous and later used in Occupy protests, and was then placed over Obama’s face in the Shepard Fairey “Hope” poster. Perhaps because Occupy is a self-described “leaderless movement” it may have more need of avatars and other images to represent itself; or perhaps its emphasis on direct democracy means mediated representations are less relevant. Either way, the Obama Fawkes Mask suggests the political efficacy of anonymity, a gentle rebuke to anyone who hangs their politics on any individual leader. Becket Flannery has lived in 4 states. He lived in Philadelphia for 2 years, where he shared a 500 sq ft studio in the Viking Mills at 55 cents per sq. ft. While in Philadelphia, he worked at the Institute of Contemporary Art, where among other things he bought 175 stackable plastic chairs. Particularly good months for him were September 2010, July, and August 2011.He currently lives in Los Angeles, where he is pursuing an MFA at the USC Roski School of Fine Art. He is founder and director of the B.E.C.K.E.T. (Bedroom Environment for Combating Kapital and Eschatological Time), a reading residency program in Los Angeles. Please e-mail him to apply.